Darby Leid ’22 dribbles the ball down the court for the Dutchwomen. Image Courtesy of Union Athletics. This past Friday the Dutchwomen’s basketball team fell to Vassar College Brewers by a score of 64 to 50. 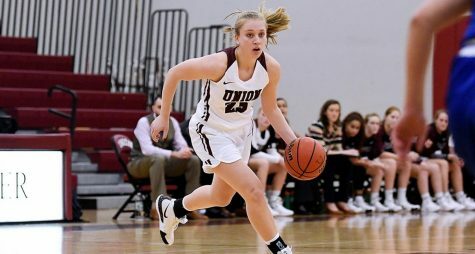 Union’s offense was led by a standout performace from Guard Darby Leid ’22. Leid, a Liberal Arts from Wayland, massachusettes, lead the offensive effort with 12 points. Leid also finished the day with an impressive .600 field goal percentage. Guard IreLee Ferguson ’21 scored 9 points. Ferguson a Neuroscience major from Andover, new Jersey and has already outperformed her statistics from last season. Her 9 points outmatched her previous season average of 3.5 points per game and 1.3 rebounds per game. Forward Sophie Borg ’19, scored eight points and recorded a field goal percentage of .500. Borg, a Psychology Major from Farmington, Connecticut, is looking to end her last collegiate season in impressive fashion and add to her list of impressive academic and athletic accolades. Rounding out the offensive performance was Guard Joana Santos ’20. Santos notched 6 points and ended the game with a .333 field goal percentage.